A healthy 44-year-old woman presented to the Emergency Department at Sultan Qaboos University Hospital with a three-day-history of sore throat, difficulty swallowing, and neck stiffness. Her medical history was unremarkable. On examination, her vital signs were normal, and she was not in respiratory distress. Her pharynx was hyperemic and her neck was tender. She had restricted neck movements. Flexible nasopharyngoscopy revealed a swelling in the nasopharynx extending towards the oropharynx. Her remaining physical examination was unremarkable. Her white cell count was normal and C-reactive protein was 39. A contrast-enhanced computed tomography (CECT) scan and a magnetic resonance imaging (MRI) were performed. The findings of the CT and MRI scans are shown in Figure 1 and 2. 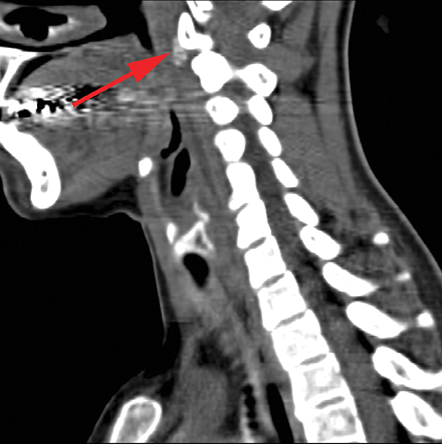 Figure 1: Sagittal contrast-enhanced computed tomography scan of neck. Figure 2: Sagittal T2-weighted magnetic resonance imaging scan of the neck. What is the abnormality in the CECT scan as shown in Figure 1? What is the abnormality in the MRI scan as shown in Figure 2? What is the treatment of choice? The sagittal CECT scan of the neck shows amorphous calcification of the longus colli muscle and a retropharyngeal effusion (red arrow). 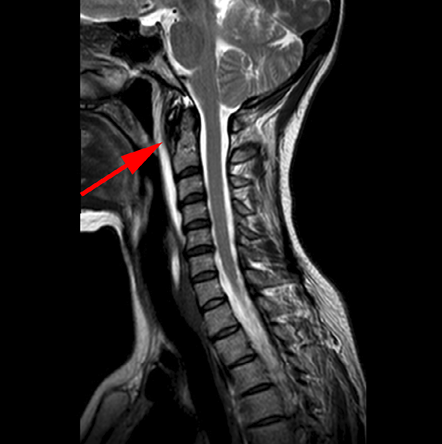 The sagittal T2-weighted MRI scan shows expansion of the retropharyngeal space with effusion (red arrow). Acute calcific tendinitis of the longus colli muscle. Acute calcific tendinitis of the longus colli muscle is a rare self-limiting condition. Awareness of this condition is crucial, as it mimics other serious conditions like retropharyngeal abscess, cervical disc herniation, and meningitis. Early and appropriate diagnosis is vital to avoid unnecessary and potentially risky invasive procedures. The management of this condition is conservative, as it is self-limiting. Administration of a potent non-steroidal anti-inflammatory drug is considered to be the mainstay of management.1–3 It is suggested that the treatment should be continued for two to three weeks.1 The use of muscle relaxants has also been advocated.1 A short course of steroids can provide rapid symptomatic relief.3 The use of narcotics is discouraged and patients are advised to avoid strenuous activities and neck movements that aggravate symptoms.3 A follow-up is recommended after one week, with further follow-up appointments in cases of patients with persistent symptoms.3 Symptoms usually improve after one to two weeks.5 Since this a self-limiting inflammatory condition, antibiotics are not necessary. Our patient improved dramatically within a few days of appropriate therapy and was discharged with no long term sequelae. In conclusion, acute calcific tendinitis of the longus colli muscle is a self-limiting condition. Clinicians should be aware of this clinical entity as it often masquerades as a retropharyngeal abscess. CT scan will help clinch the diagnosis and avoid unnecessary use of antibiotics and potentially risky, invasive procedures. 1. Silva CF, Soffia PS, Pruzzo E. Acute prevertebral calcific tendinitis: a source of non-surgical acute cervical pain. Acta Radiol 2014 Feb;55(1):91-94. 2. Hartley J. Acute cervical pain associated with retropharyngeal calcium deposit: A case report. J Bone Joint Surg Am 1964 Dec;46(8):1753-1754. 3. Horowitz G, Ben-Ari O, Brenner A, Fliss DM, Wasserzug O. Incidence of retropharyngeal calcific tendinitis (longus colli tendinitis) in the general population. Otolaryngol Head Neck Surg 2013 Jun;148(6):955-958. 4. Chung T, Rebello R, Gooden EA. Retropharyngeal calcific tendinitis: Case report and review of literature. Emergency Radiology 2005 Nov;11(6): 375-380. 5. Southwell K, Hornibrook J, O’Neill-Kerr D. Acute longus colli calcific tendonitis causing neck pain and dysphagia. Otolaryngol Head Neck Surg 2008 Mar;138(3):405-406.